The Genie of Aladdin's Lamp is a powerful genie who inhabits the magic lamp in the story Aladdin. Although it has been represented in several forms in animation over the years, its only Mario-relevant appearance is in The Super Mario Bros. Super Show! 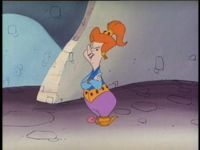 episode "Mario's Magic Carpet", where it appears as a female who is extremely cranky and obnoxious. In the episode, Mario and Luigi obtain Aladdin's Lamp from the treasures of Sultan Pasbah. They rub it, summoning the Genie, who has extreme difficulty escaping Aladdin's Lamp, which remains stuck on her foot. After her summoning, the Genie is asked by Mario to save Princess Toadstool, who is about to be sold by Sultan Pasbah to King Koopa. Attempting to use a magic spell, the Genie only succeeds in creating a horrific stench and a black fog (a magic smell). This smell and fog ends up allowing King Koopa to successfully kidnap Princess Toadstool and speed her away on his flying carpet. Chasing after King Koopa, the Genie is asked by Mario to give him, Luigi and Toad the power of flight, so they can chase King Koopa. At first, the Genie refuses to cast the flight spell, saying it will drain her power, eventually though, the Genie agrees after Mario offers to pay her a coin. Unfortunately, the spell simply launches Mario, Luigi and Toad directly upward through the air instead of allowing them to fly, much to her confusion. Later, the Genie travels with Mario, Luigi and Toad on their recently purchased flying carpet, complaining the entire time. It is only after Princess Toadstool is rescued from the quicksand King Koopa had dumped her in that the Genie decides to abandon Mario. Re-entering Aladdin's Lamp, the Genie throws herself off Mario's magic carpet, only to land in the front seat of King Koopa's own flying carpet. Exiting Aladdin's Lamp, the Genie proceeds to pester and annoy King Koopa, much to the amusement of Mario, Luigi, Toad and Princess Toadstool. This page was last edited on February 11, 2019, at 04:59.